Catscratch!. 图片 from the Nick show: Catscratch.. Wallpaper and background images in the Nickelodeon club tagged: nick nickelodeon catscratch. 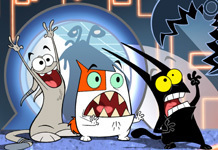 图片 from the Nick show: Catscratch. This Nickelodeon photo might contain 动漫, 漫画书, 漫画, 卡通, and 漫画卡通.